This is a great polymer clay tutorial that has many uses. Mokume gane can be used in beads, projects, jewelry, covering, and even as a background for textured and embossed pieces. Mokume gane is versatile and offers hundreds of color combinations, color palettes, and unique design patters, that you can not simply plan. Thanks for join us for this polymer clay tutorial. Read our other polymer clay tutorials here. Blades, needle tools, ball tipped tools, and other tools to indent your clay, as well as a piece of cardstock or other paper to work on, and a pasta machine. And don’t forget the most important: a cup of coffee. Next choose 4 colors of clay. You will need 1/4 a block of each color you choose. Make sure at least ONE is a metallic clay. You will be adding glitter, embossing powders, and metallic leaf to some of the clays. Also grab ONE full block of translucent clay. Next condition all your clay and keep them separate. You can do this however you like, with your hands, cutting it into pieces, running through a pasta machine, banging on it with your roller…whatever works for you. If you are using a pasta machine, run it through the pasta machine on the largest setting. Next, pick what you’re going to use to accent your clay. This will give to mokume gane a nice texture and a surprise with every slice! Next put your leafing on your Transparent clay only. You’ll notice the pieces on the right hand side are almost completely covered with foil. These two pieces are covered front AND back. The two pieces on the left are covered (lightly) on one side only. Next choose 2 of your clays to add glitters to. For this I chose pink & orange. I added regular sparkle glitter to the orange clay and pink glitter to the pink clay. Your conditioned clays with their inclusions and additives are now ready. Run them through the pasta machine at the 5th largest setting. Now stack your clays in any pattern you wish. color, 2 sided leafed transparent, color, & one sided transparent. This will make the beginning of your loaf. This is now an 8 layered loaf. Now use your roller and flatten the loaf. You’re going to put it through your pasta machine at the largest setting, so flatten it by hand as much as you can. It will be really long and flat after running it through the pasta machine. Now cut the loaf in half (just eyeball it, no need to be exact). Here’s the important part….stack it the EXACT same way! Do NOT turn the loaf over. Now you have a 16 layer loaf. Continue to roll our your new loaf of clay. Cut in half and stack the SAME WAY again. Now you have 32 layers! Roll the 32 layers again to flatten…. Then cut in half again & restack. Now you have 64 layers of clay! This constant rolling locks the layers together and gets the air bubbles out. Check out your hard work! 64 layers of colorful, wonderful, yumminess! Now squish and mold into a block with your hands. Constant pressure and rolling to create a thick block, or loaf. Your loaf should now be seamless with no funny ends sticking out. Now take that loaf, pick a side, and poke it! Do some things deeply and some things only part way, while others should remain shallow. Here’s what I did to my loaf. Do it shallow, halfway, deep, whatever! Use whatever blades you have, crinkle, flexible, straight, whatever. Now you’re going to push it back into a “healed” loaf. Use your hands and push, push, push. The clay should be very soft by this point and push easily. Remember you can’t mess this up, so just push! Here’s what my loaf looked like after I “healed” the impressions that I made on it. Now roll over it again to seal it and take out the majority of the air bubbles. Here’s my healed and rolled loaf. NOW TURN THE BLOCK OVER TO THE OTHER SIDE & DO THE WHOLE THING AGAIN! Now push it all back together and heal the loaf! Push until it won’t heal any longer. Now roll over the top to flatten the loaf, continuing to heal it and get out any extraneous air bubbles. Turn the clay so that you can see the “grain” of the loaf you’ve created. Use your flexible blade and slice the same direction as the “grain” of the clay. Slice as thin a sheet as possible. Here’s the first pattern that was revealed in our loaf. As you cut, you will reveal new treasures, hidden secrets, and really cool designs in your loaf. If you liked today's article, sign up for our email list to get more free tutorials, tips, color recipes, & more! Use your Mokume Gane to decorate pens, your tools, make jewelry and beads, whatever your heart desires. 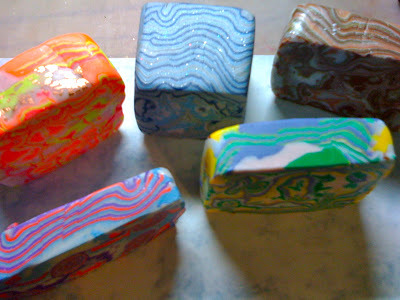 Here’s some of the recent Mokume Gane loafs that we have made. Notice how each and every block is different?! This is the really neat part to Mokume Gane. I’ve really fallen in love with Mokume Gane and can’t wait to explore all of its possibilities! Thank you so much Tracy! I’m so glad that you enjoyed it – I can’t wait to see what you create from it. While watching YouTube videos, and Magic by Leah was one of them (she did a terrific job of Mokume Gane! several videos to prove it, too! ), I happened to glance over at one of the Chrysanthemum Canes I’ve made from scrap clay. It had lots of colors, a little glitter, no gold leaf, but it just seemed to scream TRY ME. So I did, and it was a very interesting Mokume Gane loaf. And it gave me a lot more options than just as a round Chrysanthemum cane, although I did like that too. This is wonderful! I am doing it now to cover some cans I have ready to store short tools in. One thing I did want to ask is: I have made two dragons from the challenge with you and Christi and I was wondering a)If we are allowed to post a photo and b) if so to what site? I have had such enjoyable time. I think I was taking my claying to serious! I am a perfections,and I thought it had to be that way with my clay. So in turn I never posted anything I did, so I am not going to grow if I don’t share and get feed back. Thank you and Christi for showing me to have fun, relax and let the crazy out!!! That’s great! I’m glad you enjoyed it and are having fun. Join us over at the FaceBook Group to share your photos. I tried your method and love it over all the other methods. I just started claying this week and didn’t have gold leaf or glitter so I used ” mirror” silver nail polish in place of leaf and translucent opal in place of glitter. Strong smell but worked ok. I LOVE my first block of Mokugami! I intend to incorporate the Clay into my chain jewelry!! Will add color and textures!! Great Angel! It’s so great to have you join us here. Enjoy your looking around. I have almost 200 FREE tutorials here on the blog, so have some fun! Great stuff – thanks Katie. Great tutorial! I learned some new stuff! Thanks Sunny! I’m glad you enjoyed it. Mokume gane is one of my favourite techniques! I love the flexibility of it and there is no way for it to go wrong. As you said there are so many different way to do this. I spotted a couple things I can do differently thanks for the tutorial! >Beautiful job!!! I dont remember it being so easy when I read how to do it in my book. This inspired me to go check on my clay and see if any of it survived 6 months in storage!! >It looks like fun! Love your tutorial, Katie! >This looks like SOOOOO much fun. Maybe I'll be able to try it sometime. >That's pretty interesting! Luv the comments on coffee, poking and blades. It looks like fun. >Thanks for the info. That looks neat. >Great photos along the way…the pens look awesome! >great post, wonderful pics! thanks! >Great tutorial! Would love to try it sometime. >Wow, that is so cool! >@Linda – It's great stress relief! >Wonderful tutorial. Very detailed and super pictures.